Waterloo City Hall is located at 715 Mulberry Street, Waterloo, IA 50703; phone: 319-291-4301. Photo: Henry Weis House, ca. 1902, 800 West 4th Street South, Waterloo, IA. 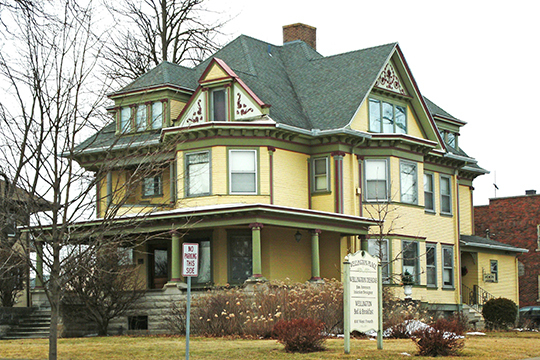 Listed on the National Register of Historic Places in 1989. Photographed by User:RifeIdeas (own work), 2011, [cc-by-3.0 (creativecommons.org/licenses/by/3.0)], via Wikimedia Commons, accessed July, 2015. Waterloo's situation in a rich agricultural region and its transportation facilities have led to its development as a marketing point and manufacturing center. One-fifth of all farm-type gasoline engines manufactured in America are made here. Other important industries are meat packing (handling more than a million head of hogs annually), tractor, cream separator, and cement mixer manufacturing, and the marketing of farm implements by mail order. Waterloo is a workingman's town with business largely dependent on the weekly pay checks. Although there are many small homes there are no slum areas. With work in the plants partly seasonal, many transient workers are employed during the busy seasons and then living quarters are scarce. With the introduction of trailers large numbers of transient workers made camps nearby the city, until the township trustees passed regulations governing them. In 1845 George W. Hanna established a home on the west bank of Cedar River and by 1848 there were settlers on both sides of the stream. The place was first known as Prairie Rapids, the name given to it by the Hanna family. In 1851 the seven signers of the petition asking for a post office left the name blank when Charles Mullan took the document to Cedar Falls to obtain the signature of the postmaster there. While he was leafing through the post office directory, Mullan happened to see Waterloo listed. It had the "right ring to it," so it was inserted in the petition. With eastern papers booming the attractive possibilities in Iowa, Waterloo and the surrounding settlements were crowded with incoming settlers. In 1858 the Cedar River rose to one of the highest points recorded in local history. Two hundred feet of the Dubuque and Pacific railway embankment were washed away. The flood waters poured in torrents through two ravines on the west side of the city, inundating the lowest portion. Settlers rowed boats through the streets and post office officials had to build a raised platform from which the mail sacks were delivered by boat. The high waters made it possible for the Black Hawk, a small steamboat, to come up the river from Cedar Rapids, and, for a while, the people thought the Cedar a navigable stream, but the steamboat trips in this flood year were the only successful ones. By 1860 Waterloo had 1,800 inhabitants. In the following decade the Illinois Central arrived, wheat elevators were built, the first park areas were planned, a brick schoolhouse was erected, and a new dam across the river replaced the old log one, and by 1870 the city had a population of 5,000. Beginning about 1875 and lasting until 1895 the city was known for its horse races, some noted trotting and racing contenders being bred here in those years. Free carrier mail delivery was started on July 1, 1887, and improved streets had their inception in 1891 when East Fourth Street was paved from the river to Franklin Street. In 1892, after John Froelich, of Elkader, Iowa, had successfully harvested a crop of grain with his newly invented gasoline engine, the Waterloo Gasoline Traction Engine Company was organized. From then on the history of the city is closely paralleled by the history of the tractor industry. The city's population increased from 12,580 in 1900 to 46,191 in 1930. The Waterloo Daily Courier, the city's one newspaper, was founded in 1858. Sinclair Lewis, novelist, author of Main Street, was a reporter on the Courier in 1908-1909. In 1889, Horace Boies, then a resident of Waterloo, was elected the first Democratic Governor of Iowa since 1854. Theodore Vail, who taught school in Black Hawk County in the 1880s, and was later nationally prominent as a promoter of the telephone industry, claimed Waterloo as his home.